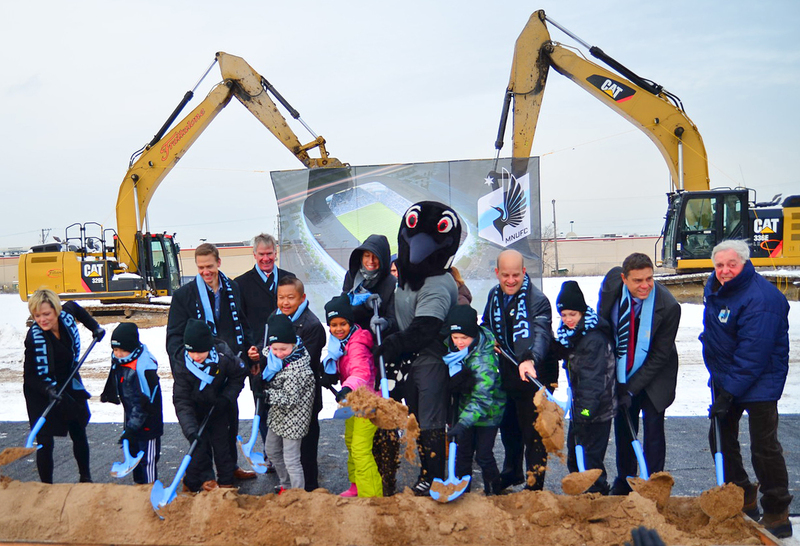 Between two large, yellow construction excavators holding a giant mural of Minnesota United’s soccer-specific stadium, team officials and dignitaries ceremonially broke ground for their St. Paul soccer stadium on Monday. The event was held at the “bus barn” site, where the new $150 million-plus privately financed stadium will soon be constructed. Joining team owner Dr. Bill McGuire was MLS Commissioner Don Garber and St. Paul Mayor Chris Coleman. 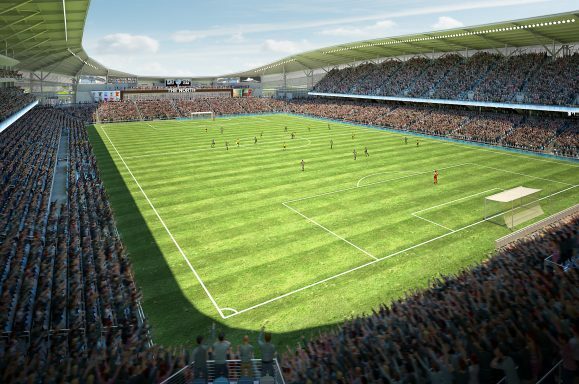 Despite the single-digit temps, Garber told fans, media, and other city, county, and state officials that “It is so great to be here again…” A muffled chuckle drifted from the audience before Garber’s frosty breath dissipated into the freezing air. 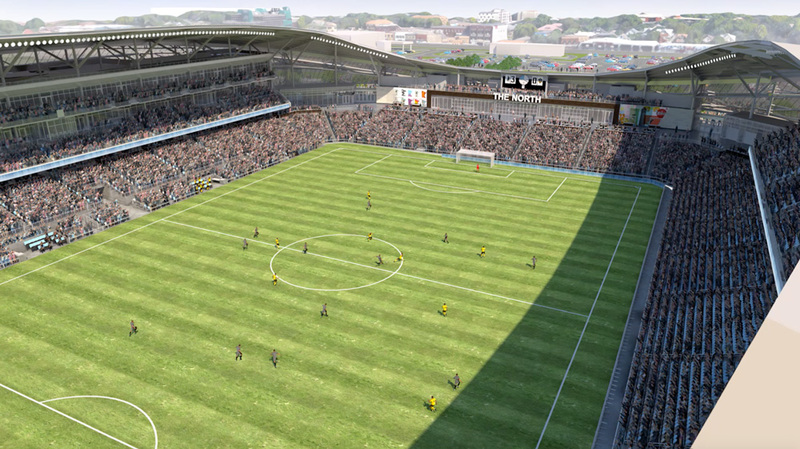 “We are so excited to have soccer coming to this corner of the world,” stated Mayor Coleman. “I’d be happy to not only host the coldest groundbreaking but the coldest championship, because we’re hardy and we can handle it.” The St. Paul mayor’s remarks were met with a round of applause and cheers. Officials scooped United-blue shovels into a box filled with dirt to signify the beginning of construction on the site. United still needs to get legislation passed to allow them the tax exemption on the nearly 10-acre site that has been tax exempt for more than 50 years. Last year when the proposal was thrown into the holdover omnibus tax bill, it had bipartisan support. A pocket veto on a technicality prevented the bill becoming law even though it had overwhelming support on both sides of the aisle. There have been several false starts on a special session in 2016 to revisit and pass the omnibus measure. Unless politicians can get something worked out in the next week, a special session would be doubtful and the bill will have to carry over into its third session, which will start in late January. 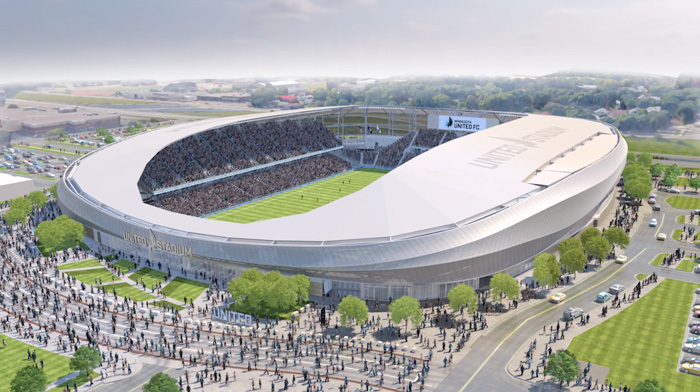 As reported here last week, Minnesota United also need to acquire another two acres of land from Midway Center landowner and NY real estate developer Rick Birdoff. 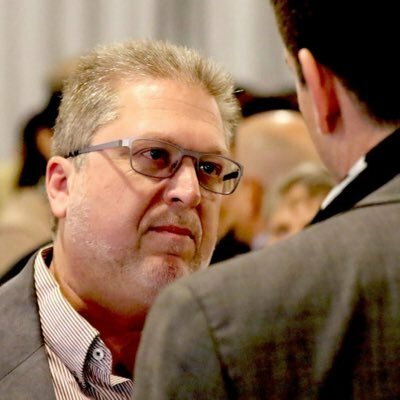 McGuire and Birdoff have yet to come to an agreement. Clearly, McGuire sees this as a stumbling block but is fully committed to the St. Paul Midway location. He later said that the event was held to show the progress they’ve made in the designing of the stadium and to help conjure up ticket sales for the 2017 season, which will be played at TCF Bank Stadium. Many of McGuire’s team partners were also on hand including the Pohlad brothers, Erika Binger, Ben Grossman, and others. Grossman — originally from the Twin Cities and a big soccer fan— shared his excitement of being a partner in a group of owners that are passionate about the sport. Dark Cloud supporters have nicknamed the stadium Cloud City for its translucent airy and cloud-like look. 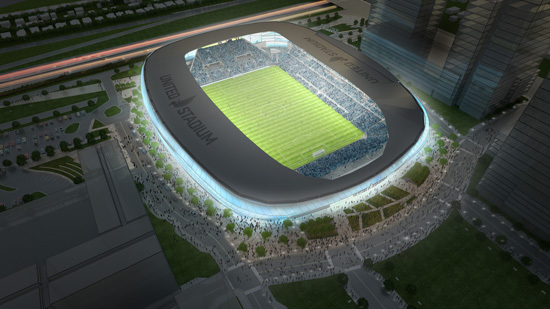 The team revealed several new images of the stadium and a new fly-through video that showed many details not previously revealed to the public. A source from the team said that nearly all the exterior design has been completed but more work will be going into the interior in the coming weeks. They hope to have all design work completed sometime in January. The team also revealed that the stadium capacity has now been set at 19,916 with possible expansion to 24,474. It will hold 25 suites, 38 loge boxes, and four clubs — one of them believed to be for the supporters section. The closest seat to pitch will be 15 feet away and the furthest only 145 feet. For those who have worried about the size of the stadium, it will be approximately six to seven stories high, or 78 feet – about the same as the tower on Spruce Tree Centre. The field will be 120 yards long by 75 yards wide while the building itself will contain 346,000 square feet. 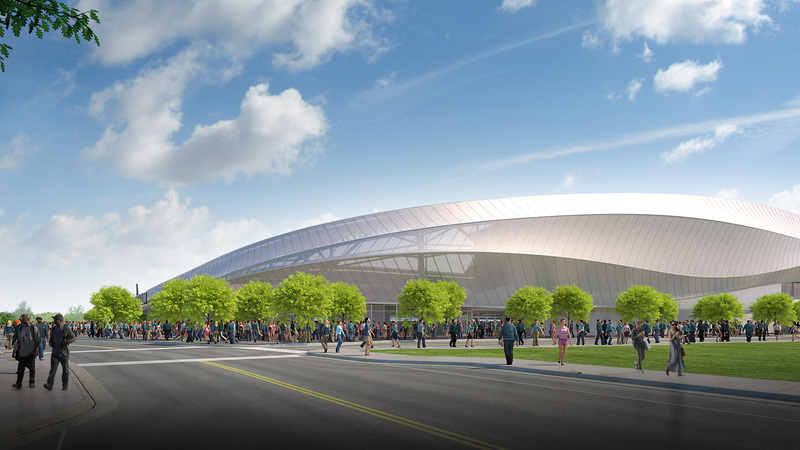 New drawings show some refinements to the roof – one of the most expensive items on a stadium. That will now cover nearly 85 percent of the fans. “The overhang has been expanded in the back, trimmed a little in the front,” McGuire said. North end with NSC St. Pauli-like scoreboard. 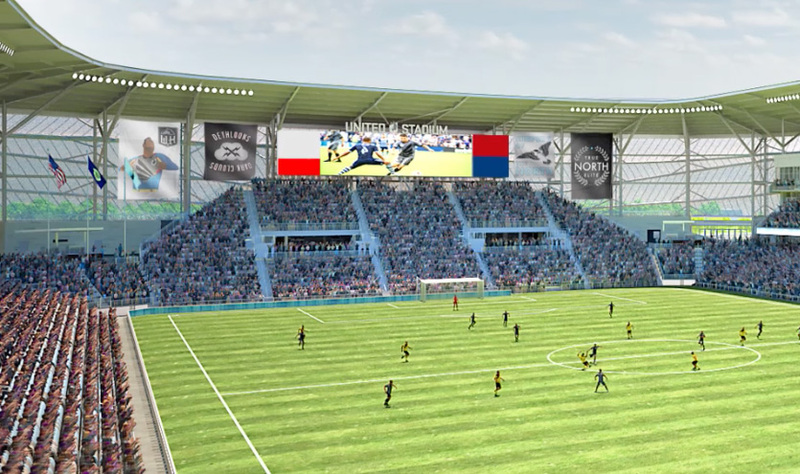 One of those components revealed in an image of the south stands is a scoreboard and clock that emulate the analog device from the National Sports Center. That clock was devised by Dark Cloud fans who traveled to the 2006 World Cup in Germany and observed the old analog clock at FC St. Pauli’s Millerntor-Stadion. 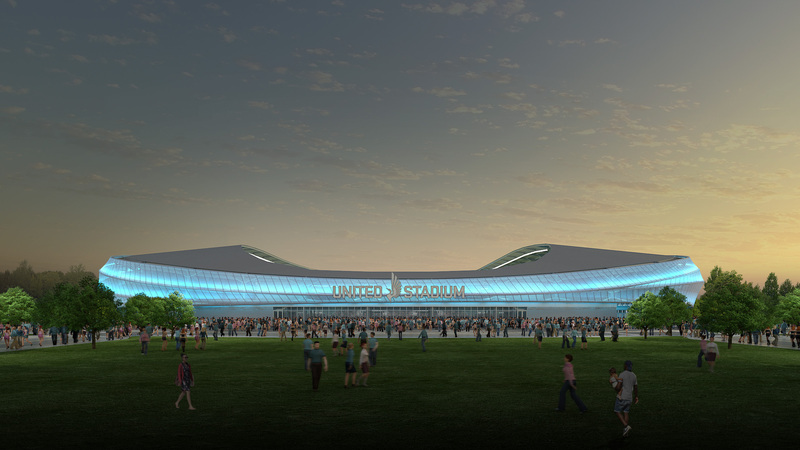 The NSC worked with the group to design it for their stadium and has become a visual landmark for United fans. Also revealed was a restaurant on the north end that could be open year-round. View of north end of stadium. 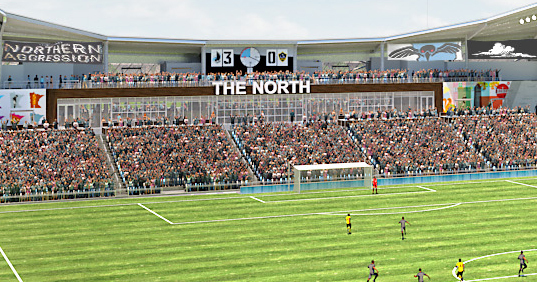 Supporters section – south end.